How To Keep 8 Gals Busy for 3 Hours! It was the SOS Stampers' turn to tackle the Cascade Card! They came prepared and ready! Such fun! 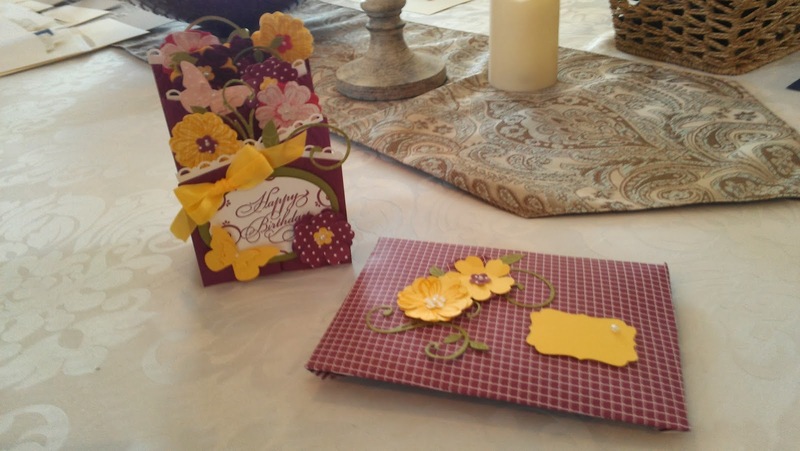 The biggest challenge is being sure to cut and fold the card base correctly. After that it's just a matter of punching flowers, cutting out flourishes, a little embossing and a little stamping and voila!! 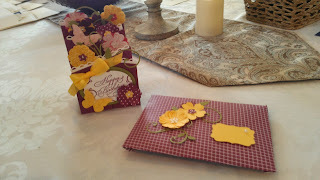 We also used the Envelope Punch Board to create a custom 5" x 7" envelope for the card. Here we are busy, busy! Special thanks to our hostess, Barbara for drinks and goodies and to Vera, Elise and Michelle for bringing all manner of delicious fare. Vera's macaroni and cheese, Elise's pumpkin dip--all to die for! Thank you gals for making it a really festive occasion!! Alice, Michelle, Vera, Barbara and Claudia are very intent on their work!! I missed Cindy Lou in this picture! of papers and lots of assembly! "honorary" member!! 3 Generations in attendance! Granddaughter Michelle, daughter Elise and mom Vera! Elise doing extra duty at the Big Shot! other out and cutting some extra images!